Enugu State University of Science and Technology (ESUT) Newly Rescheduled Post-UTME and Direct Entry Admission Screening Exercise for 2018/2019 Academic Session. 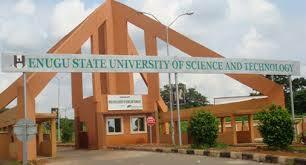 The Enugu State University of Science and Technology (ESUT) has rescheduled its Post UTME screening exercise for all the candidates who chose ESUT in the 2018 UTME. Consequently, the ESUT Post UTME screening exercise earlier scheduled to commence on Monday, August 20, 2018 shall now commence on Thursday, August 23, 2018, and to end on Wednesday, August 29, 2018.